Mesut Ozil broke his silence with a congratulatory tweet to his team as Arsenal beat rivals Tottenham 4-2 without him today in the North London Derby. The German playmaker’s absence from the squad raised one or two eyebrows before the game started, with Arsenal’s official Twitter account reporting that he had a back spasm keeping him out of action. However, rumours were also doing the rounds that Ozil had had a falling out with manager Unai Emery after learning he would not be starting against Spurs. Ozil was left on the bench for the win at Bournemouth last weekend and Emery did name an unchanged side today, so it is perfectly possible that the 30-year-old was not in his plans. 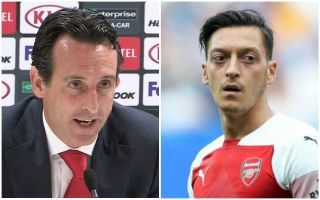 Emery was also asked about Ozil after the game, and while he seemed to confirm the player had a problem with his back, he didn’t seem keen to chat about it and admitted he didn’t know if he’d come to watch the game. Exchange between reporters and Emery on Mesut Ozil. Q. Could he have played? Emery: "He has back ache." Q. When did he get that? Q. Was he here today?